For me, January always brings thoughts of the spring that is to come and places I want to visit when the longer, warmer days are here. I'd love to visit Longstone, the Isle of Wight's famous Neolithic megalith - and here is a photo of it taken by a friend, Alan Cassady-Bishop. Alan described the site as a "holy place, filled with emotions." It isn't the first picture of the Longstone I've been sent to post on my blog. Back in 2011 Vivienne sent in another view of it. 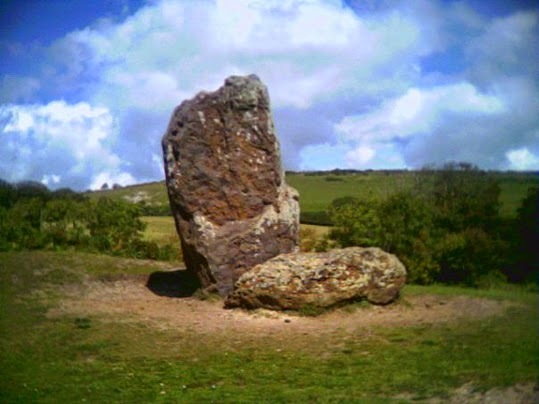 If you have any photos of standing stones and other ancient sites worth visiting and would like me to post them on A Bad Witch's Blog, please let me know. I'd love to see them.